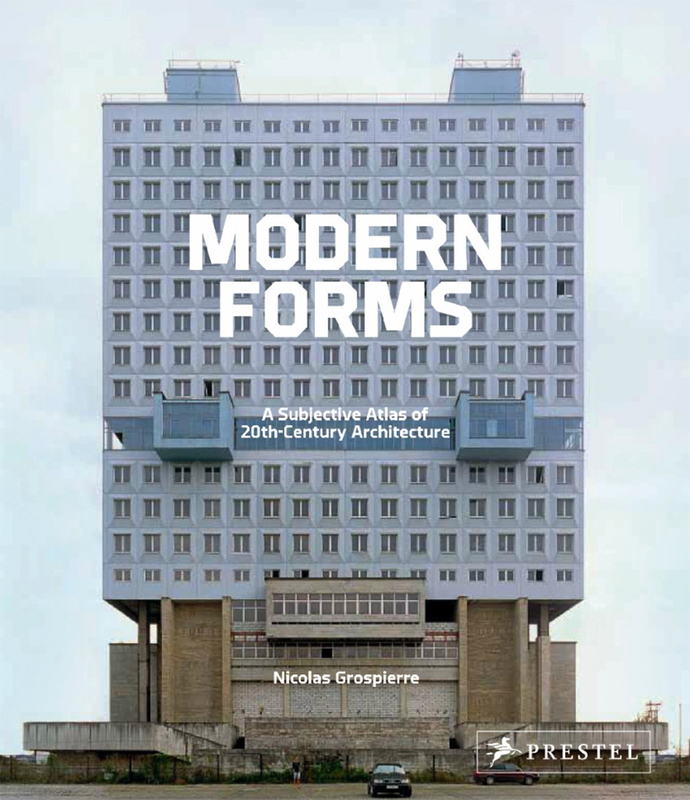 The building on the cover of this compact edition of Nicolas Grospierre's 2016 Modern Forms falls on page 84, about halfway through the 186 pages of fairly straightforward photos of modern architecture. The building looks occupied, if a bit lifeless. But occupied it's not. As described in the back of the book, the House of the Soviets was never completed after its 1967 start "due to structural problems." But in 2005 the exterior was painted blue and windows were added when President Vladimir Putin visited to celebrate Kaliningrad's 60th anniversary. On the page opposite is a parking garage in Dallas, the walls between its concrete slabs and columns intentionally open -- no need to fill them in with windows. Turning the page we see two more buildings, both about the same size as the House of Soviets and the Texas parking garage, but they appear to be ruins. 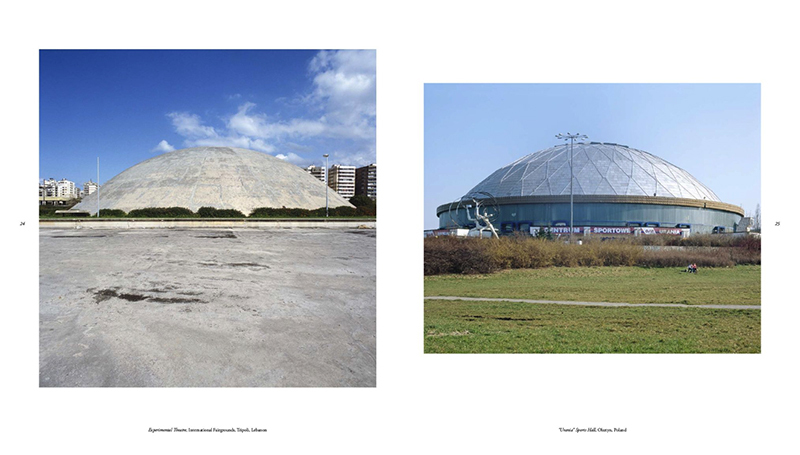 In fact they are hotels in the country of Georgia that were then occupied by refugees and demolished between Grospierre's photos and the book's publication. The few examples above get at a couple of Modern Forms most interesting facets. 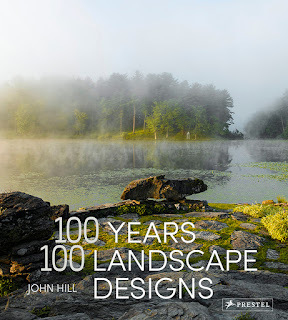 First is that the sometimes unassuming forms conceal hidden histories and deeper meanings that are revealed in the book's index. 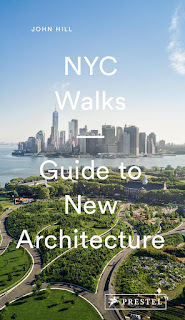 The photographs on the page are treated simply, accompanied only by the building's name and its location. Such information as the architect and tidbits like the examples above is kept to the back so as to not overshadow the forms captured by Grospierre. 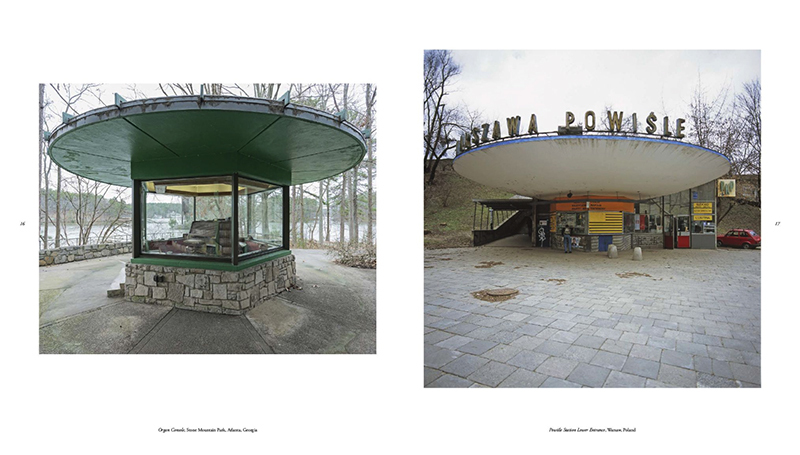 Second is how the photos are grouped, both as spreads and as a flowing gradient throughout the whole book. 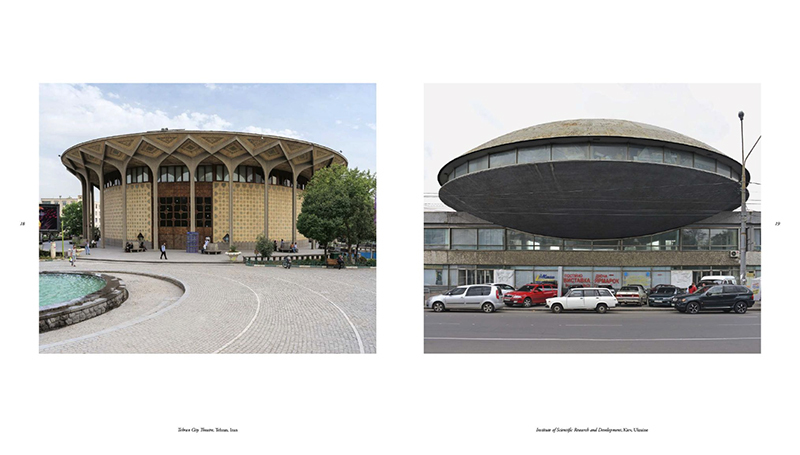 The spreads below, from the beginning of the book, reveal how shapes and forms (circles, domes) drove the pairing of photos and slowly evolve as the pages are turned; so by page 84, when we come upon the rectilinear cover building, circles and domes have morphed into sawtooths, hyperbolic paraboloids, and other forms. By the end, circles appear again, such that the book effectively loops back on to itself, like a snake eating its tail. 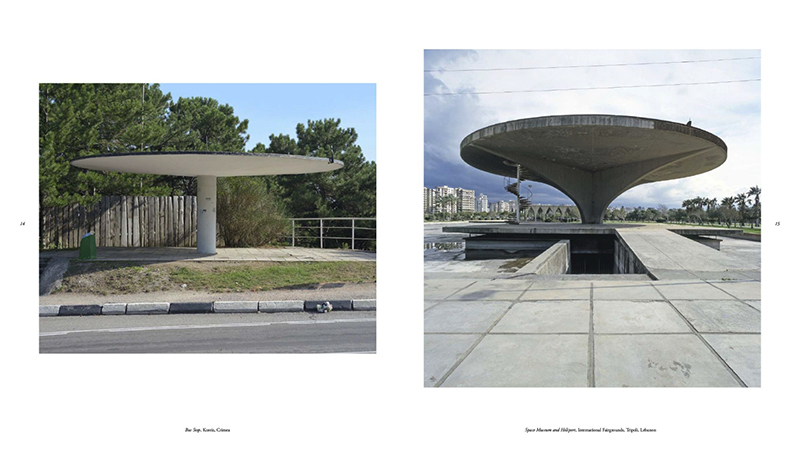 That the first photo -- a bus stop in Crimea -- is repeated as the last photo makes this intent explicit.